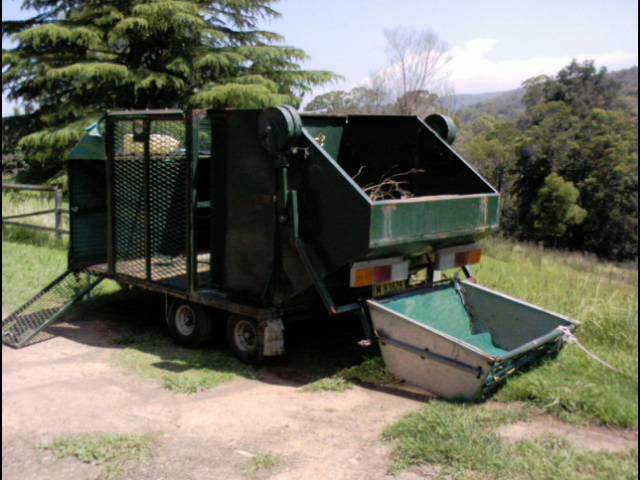 Lawn Mowing trailer with multi stage hydraulic tipper. 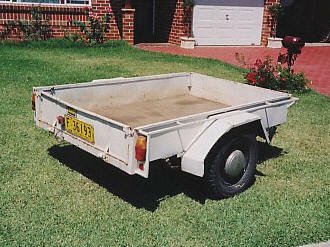 Space for ride on and self propelled mower, chasis built with 4mm steel and tipper with 3mm steel. Tub 2.4m wide x 1.8m long. 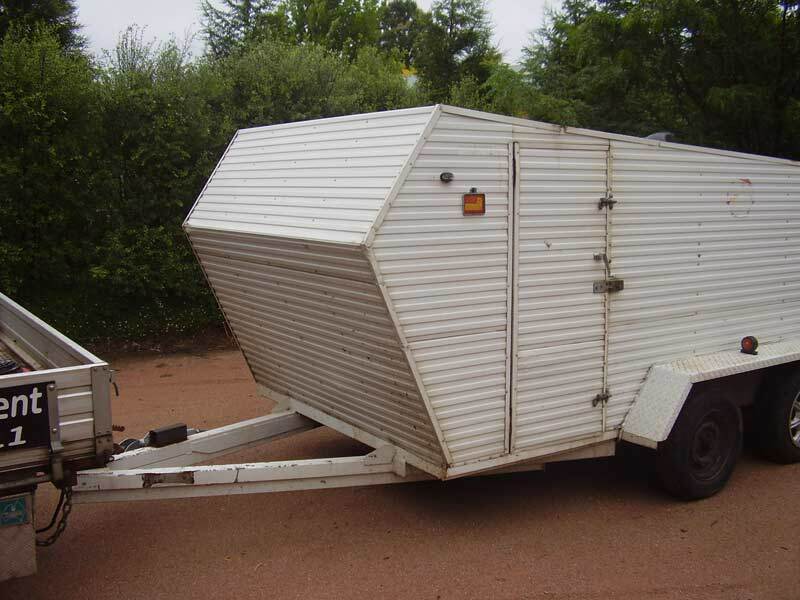 Trailer 2.4 wide x 5.6m long. 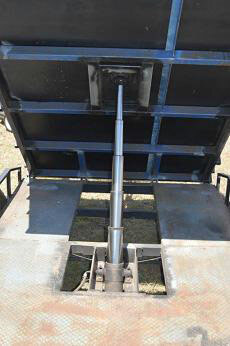 Fold down section on tipper tub designed so that a Walker mower with high life dump can tip into it. 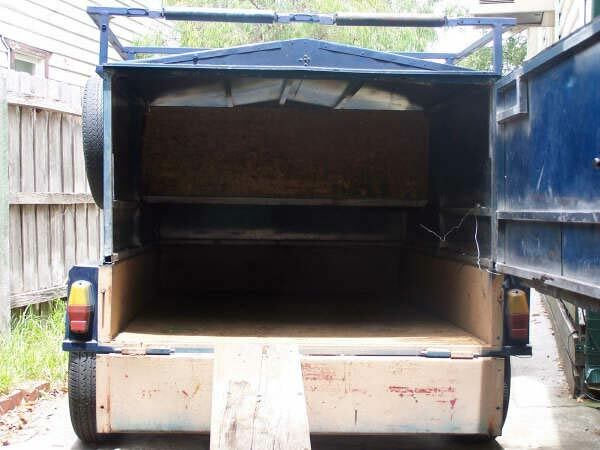 Needs painting, this can be arranged for an extra cost. Surplus to my needs due to business changing direction. 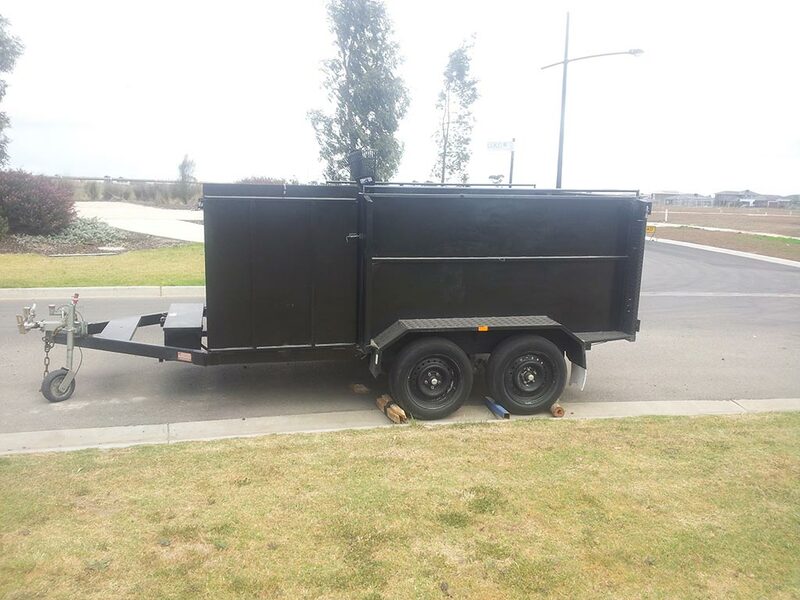 Custom made trailer built this year I have no need for it due to personal reasons of getting out of business, it is a tipper with tool box at the front section and tipper at the back it has rock roller suspension. 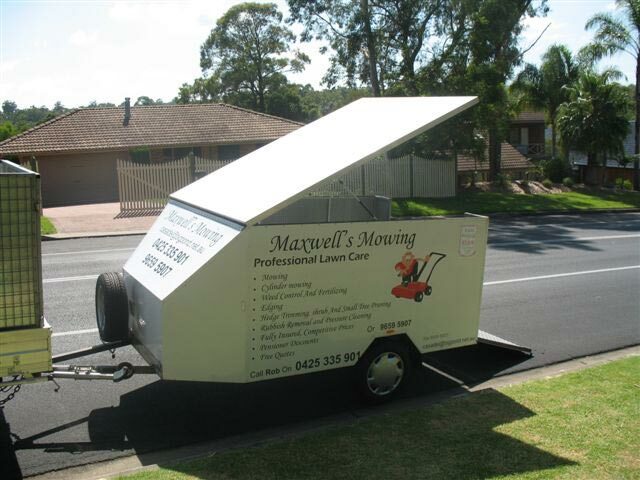 It is 192 cm wide 130cm high toolbox is 110cm long and tipper is 230cm long. 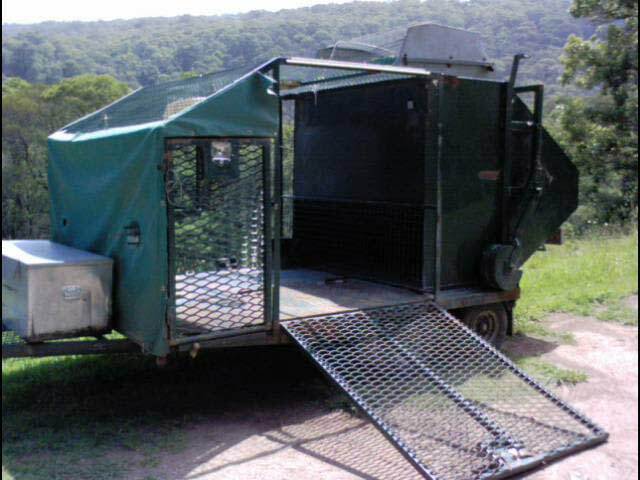 Main cage 2740mm L x 1520mm W x 1500mm H (9ft x 5ft x 5ft ) Rear ramp 1600L . Front mower deck 2040mm L x 660mm W x 100mm H. Ramp 620mm L.
Was originally bolt on cage but had extra side supports for front & rear. Takes a 54inch ztr on it with ease. 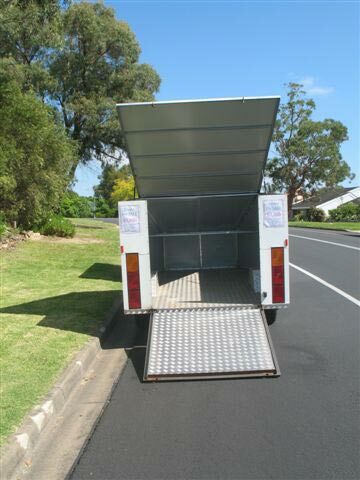 Trailer weight 550kg, total capacity 2000kg. 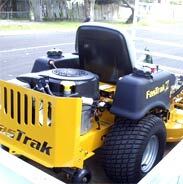 Offers $2200.00 + gst welcome. 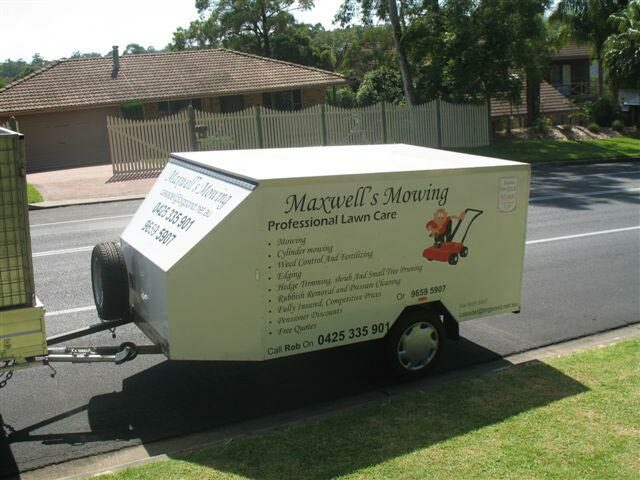 Trailer for Sale: Lawnmowing/Motor Bike Trailer Fully Enclosed. 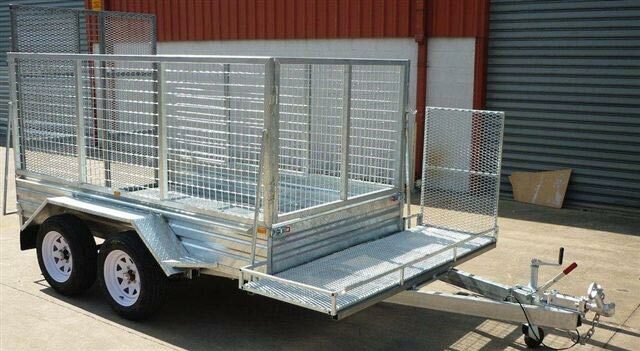 10x6 or 3metres long x 1.8 wide x1.25 high Gate width 4 feet or 1.20. -Checker plate floor, no rust. -Spare Wheel and Tyre Brand New. 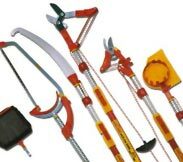 -Tie down Points. 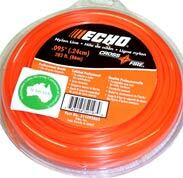 Fully Lined with galvanised mesh to hang brushcutters and tools. 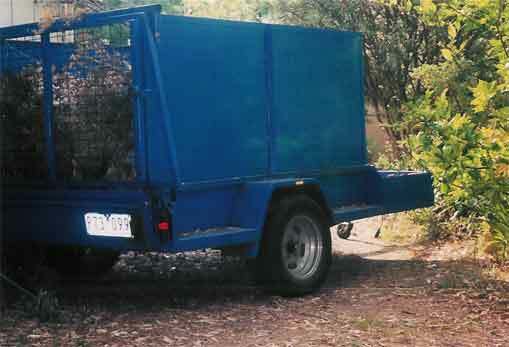 -Can hold up to 6 cubic metres Mulch/Garden Waste. 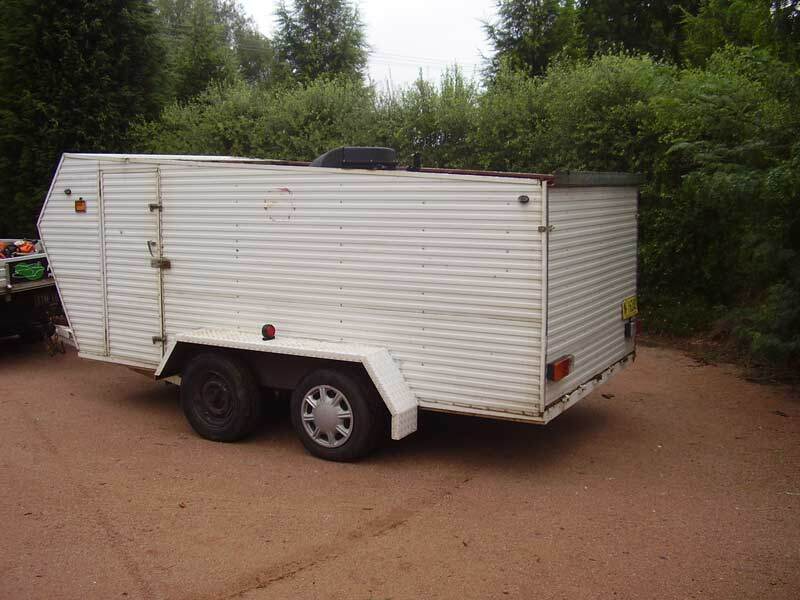 Trailer in excellent condition, Nothing to Spend, Built Jan 07, Registered to Jan 09. Like brand new Castle Hill, Sydney. Duel axel hydraulic brakes fully eclosed and lockable. 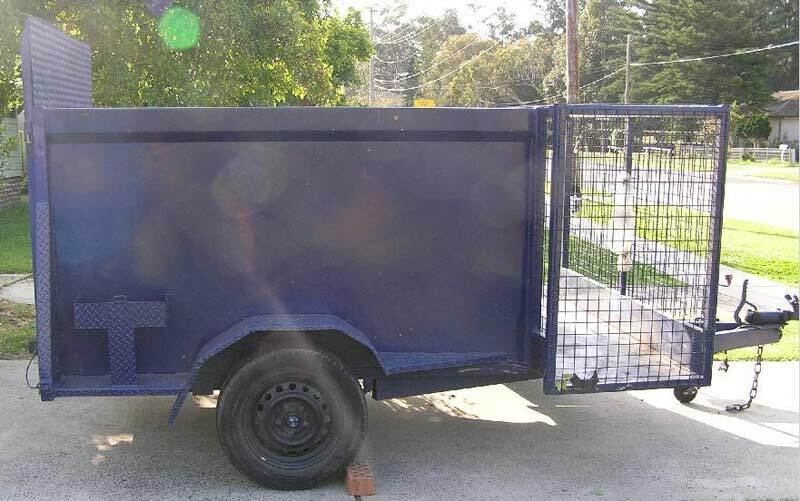 Roof is currently off the trailer but is easy to reattach and is include as are several wire basket shelves etc. Rego NSW till may '08. Tows well. 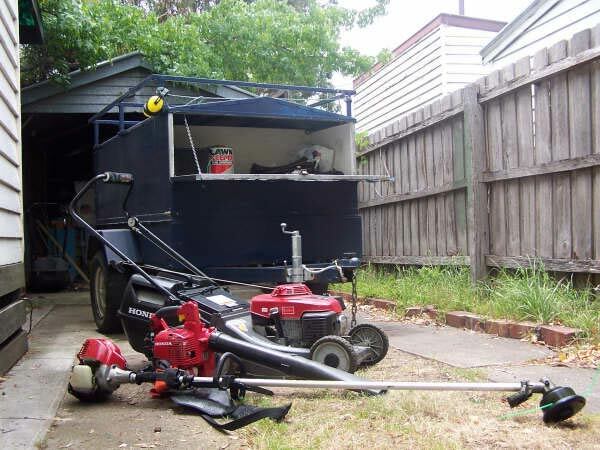 Heaps of room for mowers tools etc. 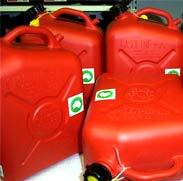 Total Turf Management. 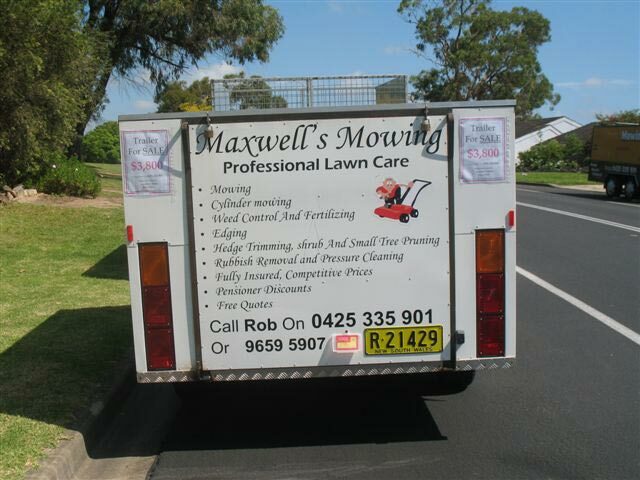 Located in Bowral NSW 1 hr south of Sydney. 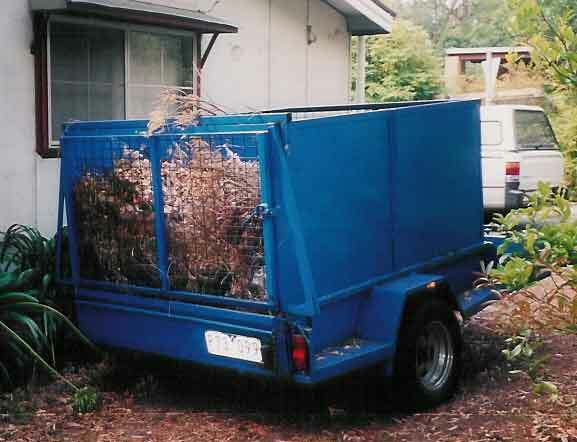 Empty grass clippings or any form of debris into the basket pull the cord and the basket empties the debri into the bin, using the counter weights. The bin then can be emptied wherever you like. Easily fit about 3m3 of mulch in the bin. Would be a great marketing tool too. 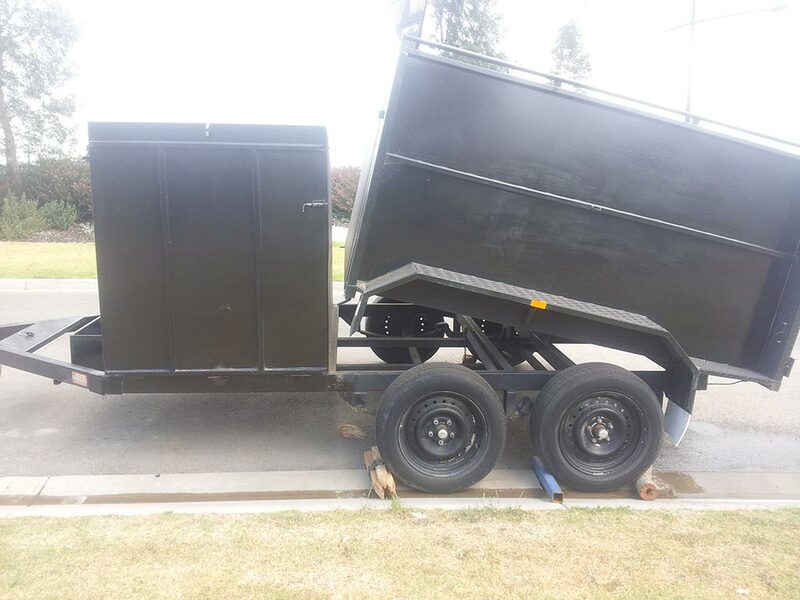 Like a dump truck but on a trailer. 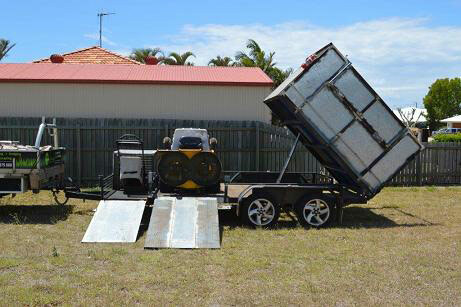 2 x ramps, 1 for ride on and the other for lawnmower, plenty of storage space for all the tools of the trade. 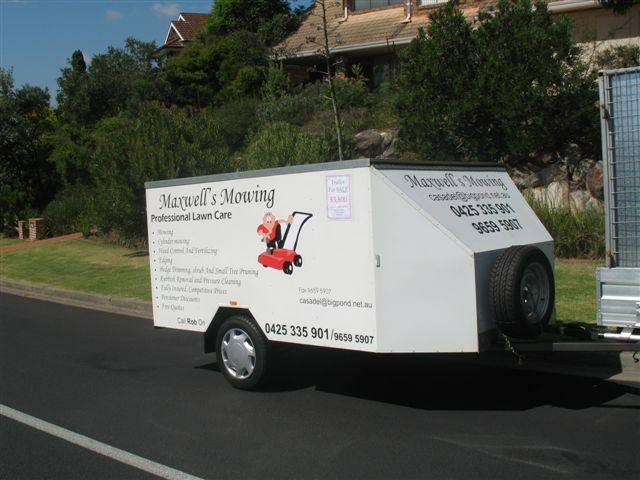 Purpose built for lawnmowing. 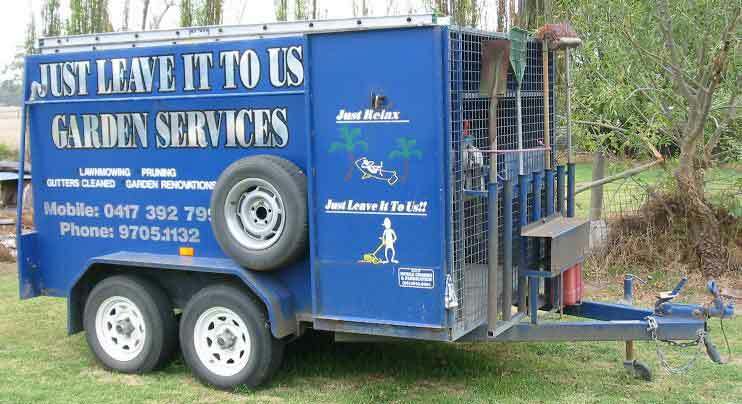 Needs some work for rego. I have no further use for it, but it really does turn heads. Located Richmond NSW. 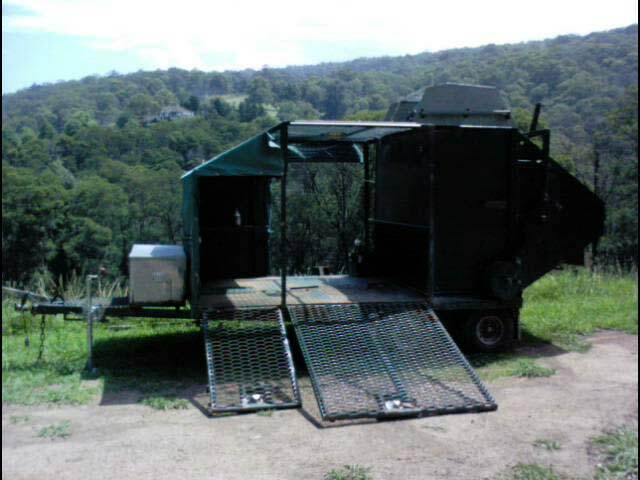 6 x 4 with ramp, cage holds 2 mowers, wipper snipper, garden tools, spare tyre, ladder, all lockable. 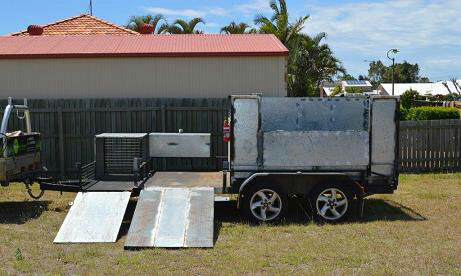 This trailer has been sandblasted, rustproofed and repainted. Very Good order. Blacktown Sydney. 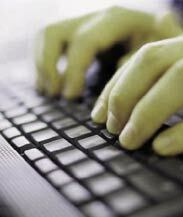 Registered till 03/2008. 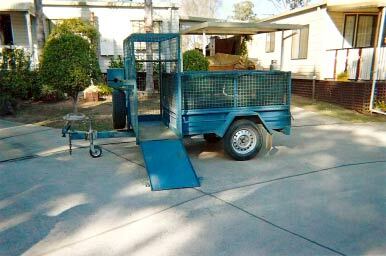 7 x 5 with rear checkerplate ramp + lockable front cage with ramp holds 2 mowers, whippersnipper & gardening tools. Includes spare tyre. 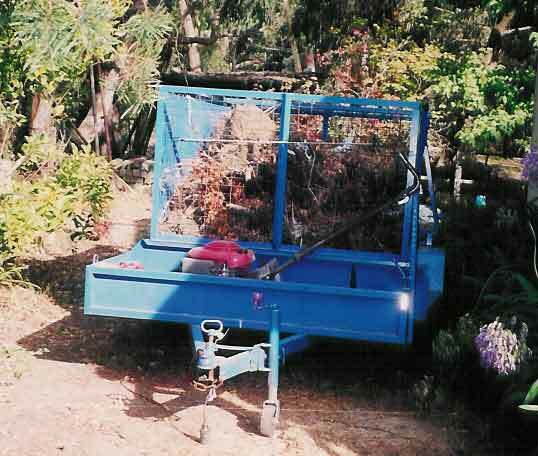 Can hold up to 4m³ mulch/garden waste. 2003 model in very good condition. 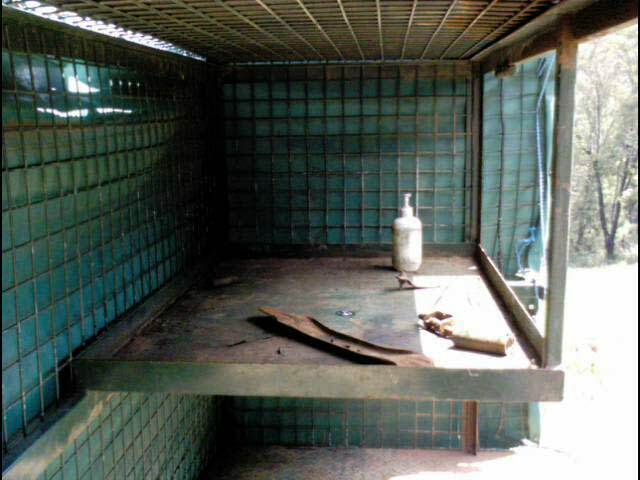 - Checker plate floor, no rust. - Spare Wheel and Tyre Brand New. - Tie down Points. Fully Lined with galvanised mesh to hang brushcutters and tools. 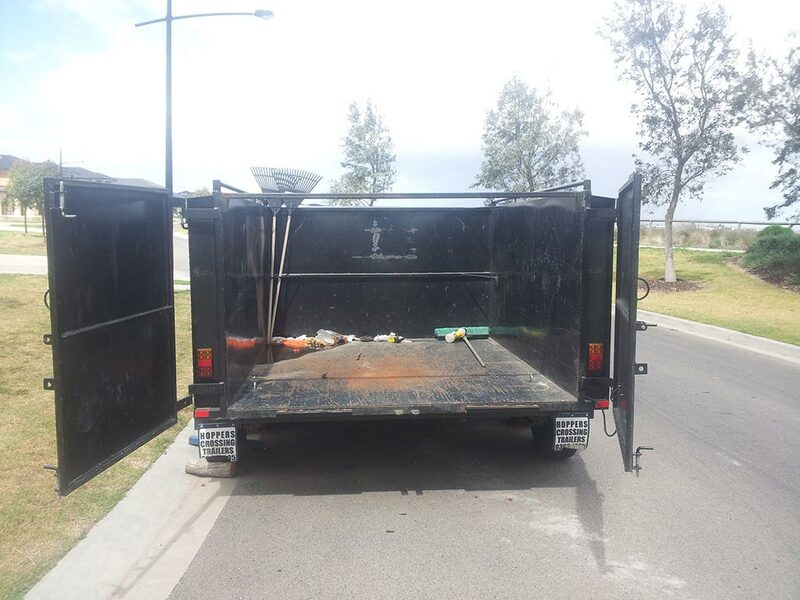 - Can hold up to 6 cubic metres Mulch/Garden Waste. 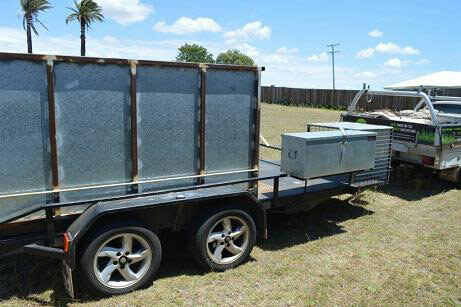 Trailer in excellent condition, Nothing to Spend, Built 1/3/05, Registered to March 10/03/08. 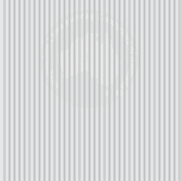 GVM 750 Tare 380. Castle Hill, Sydney. 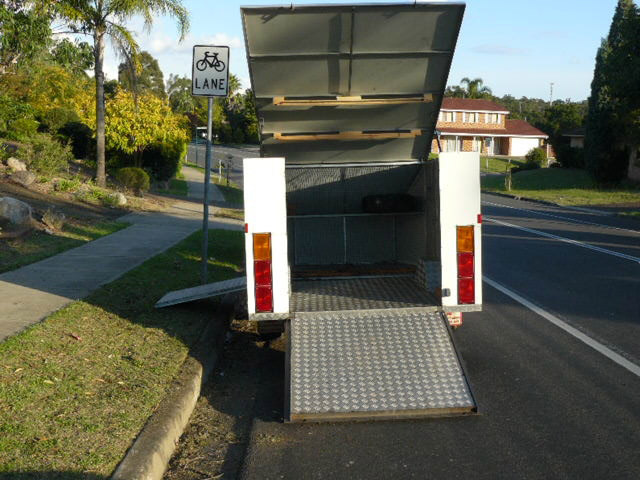 Replacement of this trailer with sign writing is $6400.00. 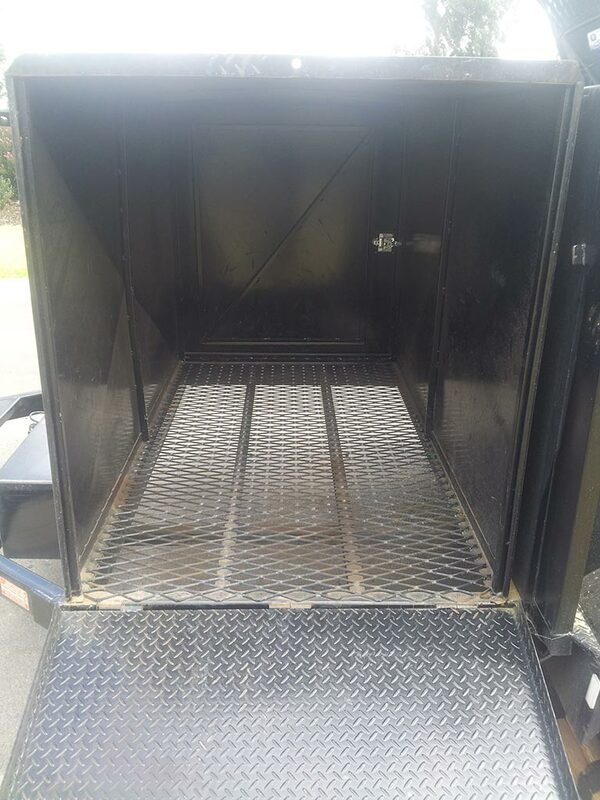 Everything required to start a new business, looking for quick sale so make an offer. 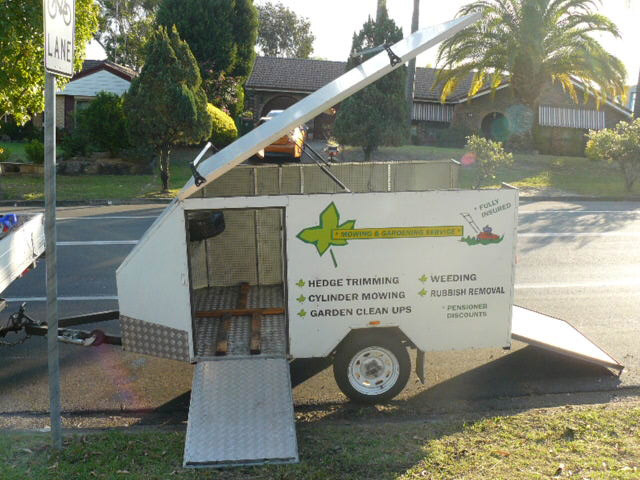 Can be delivered to sydney, located in newcastle area. Price - $2500 very negotiable, make offer you may be suprised. 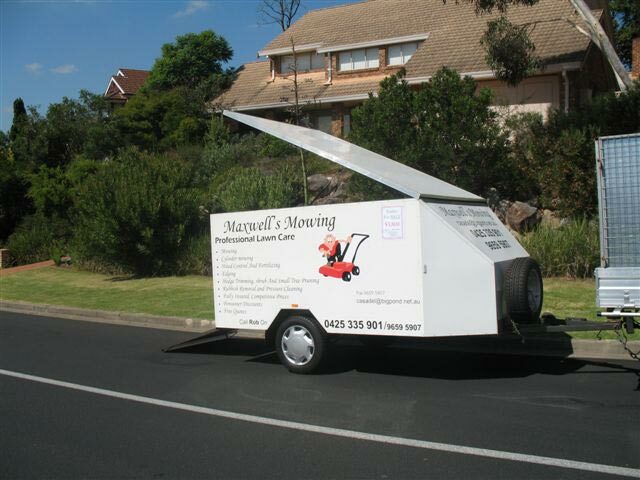 1.6m x 1.8m and has rego until March 2005. 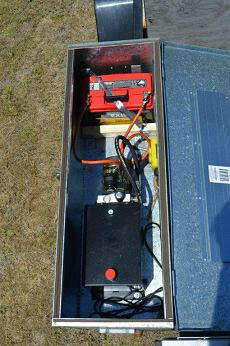 Lights are attached to the trailer, however, only work when they want too! 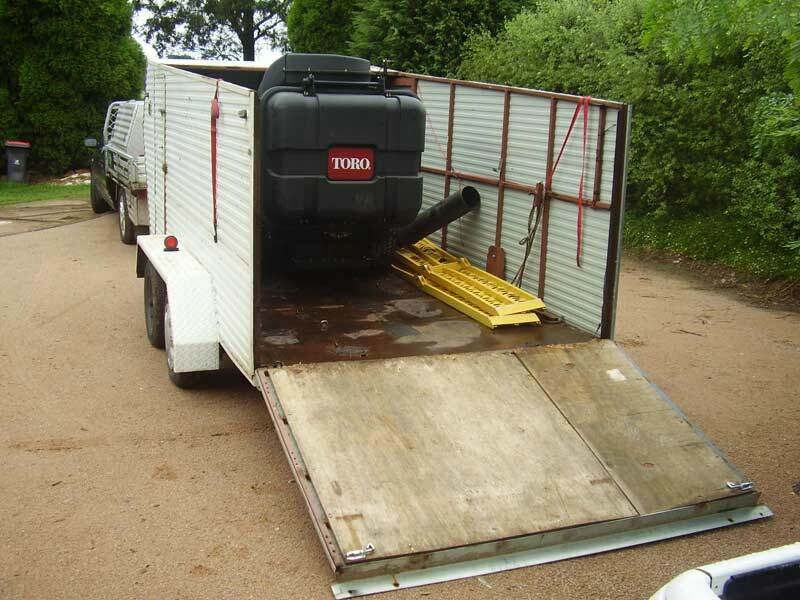 Whilst the trailer is not in A1 condition it is nevertheless in good nick. 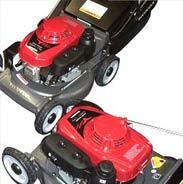 Honda HRU195 Mower approx 5 hours use. 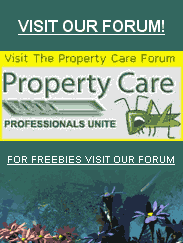 Atom Edger 4Stroke Honda Professional, Kaaz Brushcutter, Echo PB2155 Blower, Echo PPSR2433 Power Pruner (unused). 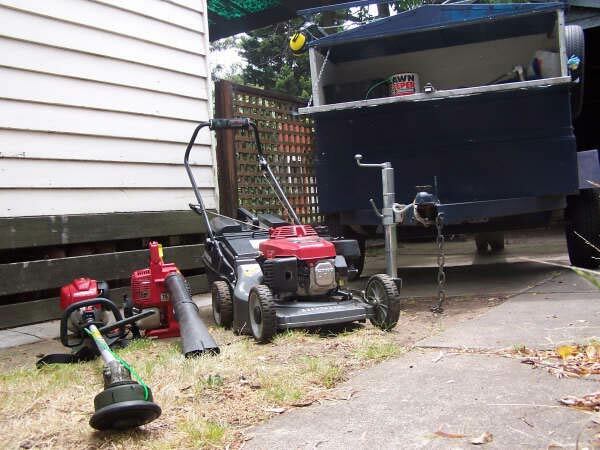 Spare parts include blades for mower and edger, Side Discharge & Mulching Plug for Honda Mower Earmuffs & Clear Screen Combo (Pro), Fuel Containers and more. 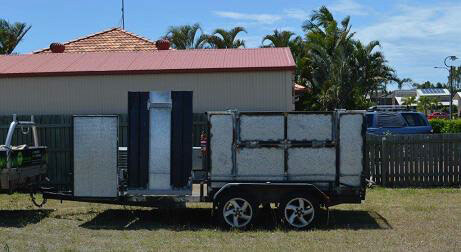 Also for sale 1 Trailer. 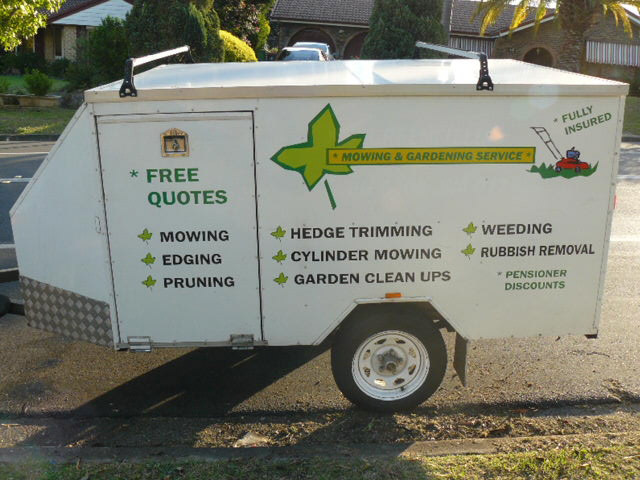 A Unique Lawn Mowing Contractors Association, not to be confused with a "non-profit" association. 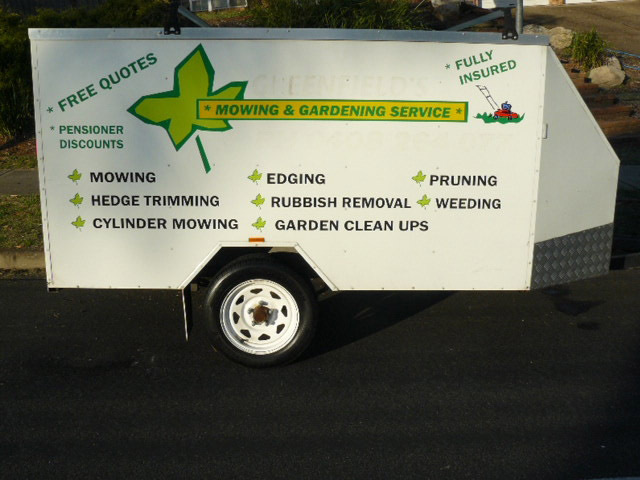 Copyright ©2007-2008 Independent Lawn Mowing Contractors of Australia. All rights reserved.